Ray (MC Kung Fu) is a carefree rapping lothario who is also adept at martial arts. He spends his time rhyming everything he says and hanging out with his two “Home Dogs” Rick (Williams) and Philthy (Phillips). When not chatting up the ladies at the local dive, he’s getting into fights with people of various ethnicities. His life changes when he meets Tina (Barbour), a “fly honey” of the first order. He gives up his womanizing ways after he falls in love with her. There is a problem, however: Tina’s abusive ex-boyfriend John (Haran) isn’t prepared to let her out of his iron fist and he wants revenge on Ray. You know he’s evil because a. he’s white, b. he beats Tina and c. he doesn’t even rhyme everything he says. What a chump. As you’ll see, John gives new meaning to the term “insanely jealous”. Amidst all his many problems, will Ray be “dope” enough to come out on top? City Dragon is really something. Yes, it’s shot on video and everything from the acting to the editing and everything in between is incredibly amateurish and incoherent...but that would be missing the point entirely! Philthy Phil Phillips, a multi-talented man, actually made this movie and got it into stores. Sure, the movie isn’t technically perfect, but you must see it to believe it. Ray/MC Kung Fu is like some sort of out-of-control cross between Saturday Night Live’s Fred Armisen and Wordsworth the cat from the old Heathcliff cartoon. And where did they find the guy who plays Rick (the self-described “wigger”)? Presumably this isn’t the same John Williams who composed the score to Star Wars (1977) Although we’re still not entirely sure. With his bug-eyed, super-fast rhyming style and whiteness, he predates Eminem by many years. But where are John Williams’ millions of dollars and record deal? Injustice I tell you. Injustice. The clothes are phenomenal. Ray’s wardrobe alone is amazing. He mainly wears a barely-existent muscle shirt in his daily life (which he is constantly taking off and doesn’t even bother to pick up off the ground after his fights, he must have a closet full of them), but when he really wants to hit the town and look classy, he simply puts an oversized silver sport coat over his black tank top. And that’s just one character. But what’s really unusual about City Dragon (besides everything I’ve just described) is how the plot moves from upbeat rapping and fun to become a family drama which tackles many serious themes: gangs, violence, domestic abuse, family strife, abortion, workplace harassment, blackmail and all manner of racial animus. Not to mention how you shouldn’t step on someone’s miniature ice cream cone or spill their soda unless you are looking for grievous bodily harm. Why Philthy would think audiences wanted to see MC Kung Fu’s domestic and workplace issues remains unclear. The saga of Ray makes for a one-of-a-kind movie. You may love it, you may hate it, but you can’t ignore it. Well, you COULD, but you shouldn’t. The “home movie” style may grate on some viewers, but the movie is funny and unique. Plus you can usually find it for a dollar or less on DVD. Unfortunately, the alcohol you will probably want to go along with the movie is sold separately. 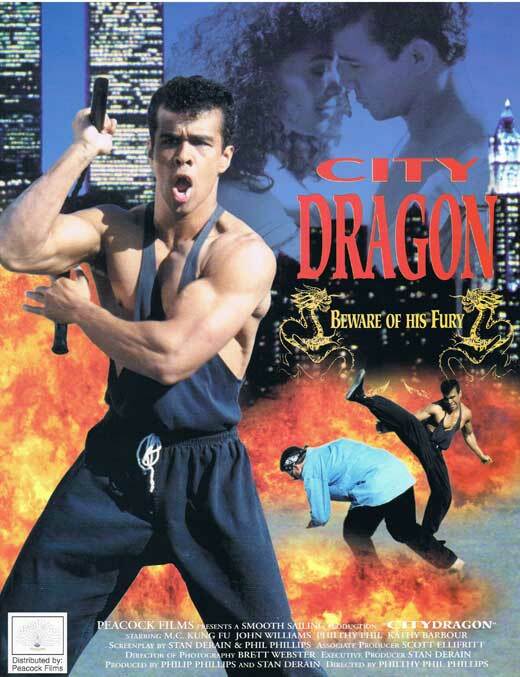 For a movie that makes Cool As Ice (1991) look like A Clockwork Orange (1971) don’t hesitate to make yourself an unofficial “Home Dog” and watch City Dragon. What a brilliant comment! that was awesome and hilarious! this is the second review of this movie i've read. now i have to see it. Will be interested in your opinion! It is very ridiculous! You had me at MC Kung Fu! Haha, the movie is as silly as his name! Niiiice. This is not a film I'd ever recommend to someone, but it's certainly one of the more car-crashy vanity action projects I've seen. City Dragon tries to be sooo many different things and fails mightily at all of them, yet becomes something entirely different in the process. This is a burgeoning cult movie. Keith: Agreed! He should have made more movies! Karl: It is totally a cult movie! Hopefully it will find a bigger audience in the future. Thanks for the link, Lee! Will have to track down a copy of the sequel! 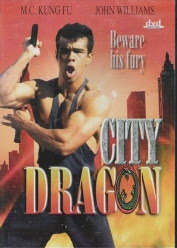 After a 16 year hiatus, Stan Derain AKA MC Kung Fu has a movie coming out THIS YEAR called War of the Dragon. IMDB it, home-piece. Just checked out the movie on IMDB, it looks like another MC Kung Fu Masterpiece!